With the kids back in school, it's time to look at the grocery budget again and adjust a few things. I don't know about your kids, but during the summer mine are always starving. And not just hungry starving. . . the whiny starving kind. Which really is the worst kind of starving. It's bored + the munchies. They go all day without snacking during school, but at home...heaven forbid there aren't two snacks plus lunch between breakfast and dinner. As a result, I'd buy lots of snacky foods during the summer and they'd be gone in two seconds. So, I'd head back to the store for more snacks...with coupons of course. And since I had a few coupons, I'd try to get my grocery totals to a magic number to take advantage of a $5 off total purchase coupon. Needless to say, I was going to the store far too often and buying lots of "extras." Time for a new strategy. Or rather an old one. Back when D was doing his undergrad, we had a very tiny budget. As we looked at the needs vs wants, we realized that D was spending a lot of money on a candy bar and soda. After all, it was just $2...but that was adding up .... fast. And looking at our situation now, I realize my trips to the store to grab a great deal are my candy bars and sodas. It's adding up. After my recent post about how to set up a food budget, I needed to take my advice to the next level. I've made a menu for two weeks. I've listed everything I'm going to need/run out of in the next two weeks. And unless it's cereal (the cereal sale isn't that hot this week!) or something under 50 cents with the coupon, I'm not running to the store. That means I'm stocking up at Costco for meats, dairy and eggs; the bread store for...well, bread; and the farmer's market for produce. Everything else...it better be in my pantry or I can make it from scratch. Gosh, it sounds less like a budget slashing and more like going off boxed goods cold turkey! Today, I spent $70 (includes tax) at Costco. 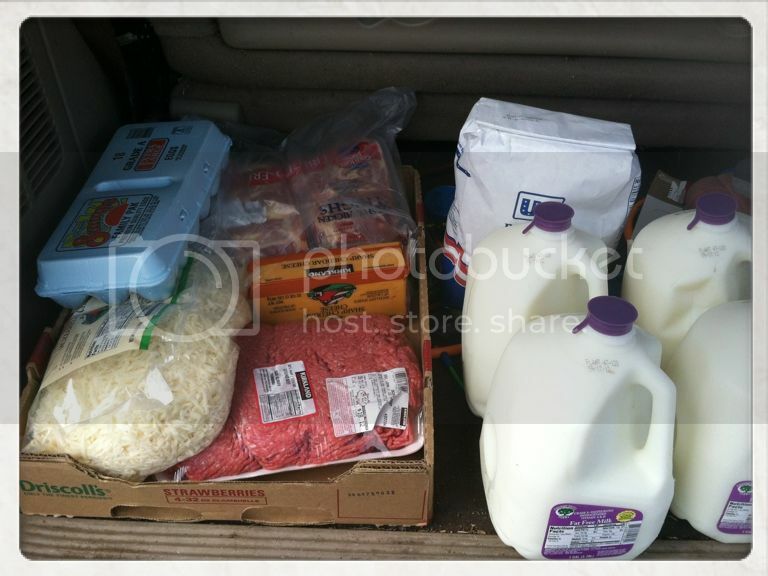 While some of the savings was small, my overall savings by shopping for these items was 30 percent! I saved 50 percent on solely the cheese. I was able to pick up four gallons of milk for what three gallons costs me at other stores. Good for you! I too am guilty of the trips to grab one or two things that as you say add up over time. I have started 2 week menu plans as well and it has also helped us eat at home rather than at 5 o clock calling my hubby and telling him to pick up take out. Not good for the budget or waistline! Good post. My kids love the snacks, too. I only buy stuff with a sale and a coupon and stock up. At one point, Goldfish crackers were almost free so we had a ton, another time we had tons for fruit snacks, and now we have cereal bars. The problem is, I won't buy more once the sale is done and my boys miss them. If there is a lull in sales, I buy a big bag of animal crackers. I tell them that's just the way it goes. Saving money is always a good thing! Thanks for the tips. I must admit, summer really threw my grocery budget out the window. I don't know why, but it happens every year. Now that school is back, it just feels easier to control the food budget. I was just making out my menu last night. Today I need to go through my pantry and see what needs to get used and what I have to buy. Thank you for sharing last week at TTF. Sorry I am so late visiting. Have a terrific day! Popcorn is a good snack you can keep on hand all the time,too, if you have a popper for the stove or microwave. My big failure is not using all leftovers. I'm working on it, but there always seems to be some waste, to my shame.